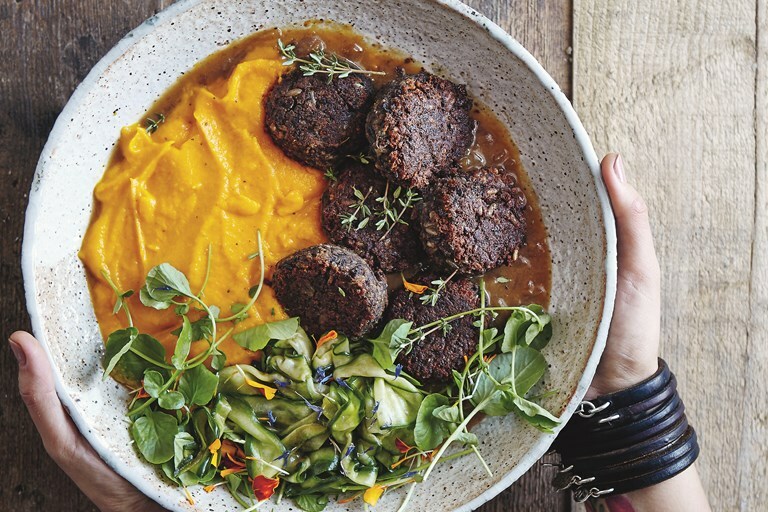 This vegan meatball recipe borrows flavours from Bettina's Scandinavian ancestry. Served with a smooth carrot mash and some quick pickles, this is a hearty dish fit for a midweek feast. This recipe is from Happy Food by Bettina Campolucci Bordi, published by Hardie Grant. Images by Nassima Rothacker. My passport is Danish, my father Norwegian and I grew up in Sweden. I have been influenced by Scandinavian culture and flavours my whole life. This is an old Swedish classic with a plant-based twist, topped off with my grandmother’s quick pickle. Truly, this is comfort in a bowl.